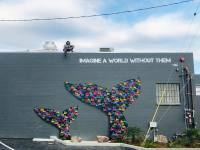 This mural is a dedication for whales and our delicate marine life. Last July an Orca gave birth to her calf which died a few hours later. For the next four days, she was carrying her calf refusing to leave her baby behind as her pod moved on. The baby’s carcass was sinking and being repeatedly retrieved by the mother, who was supporting it on her forehead and pushing it on through the choppy seas to catch up to her pod. The Center for Whale Research, which monitors the whale population for the American and Canadian governments, reports that three years have passed since an orca residing in the area has birthed a surviving calf. The survival rate in the past two decades has been 75%. Only 75 killer whales in the endangered group, known as southern resident orcas, remain. The orcas’ decline is linked to the failure of another iconic Pacific north-west species, the Chinook salmon. Like the southern resident orcas, several Chinook stocks are listed under the US Endangered Species Act. Orcas have struggled to feed as stocks have declined. It’s our responsibility to care for this planet and all of its inhabitants. It’s all one giant system and as the system starts to fail it will ultimately affect our own survival. Thank you Rincon Brewery & the city of Ventura for the opportunity to bring this installation to life.